Multi-level marketing ( MLM) is one of the most famous form of business in Cameroon. Network marketing companies in Cameroon are increasing everyday bring many products in the Cameroon market especially health and beauty products. Businesses generally use network marketing /mlm to increase their sales volume by offering bonuses to those who are able to introduce their products to new distributors or resellers. This is an old form of business which even cryptocurrency companies like Solid trust pay,Payeers,Swisscoin and others using it to reward their existing customers. we went around to find out which MLM companies are actually operating in Cameroon . 52 weekly pay is a virta cash product . The company offer investment opportunities to Cameroonians with payment option being mobile money,both MTN and Orange. According to information we gathered from the website of 52weeklypay, users invest and wait fpr their money to make profits. If you refer another person, you will be rewarded(MLM) . The company head office is said to be located in Bamenda . There is no product to market when you subscribe. You just have to refer and watch your money grow. 2. Edmark International MLM program. Edmark is company offering health products to then public. The company equally offer opportunities for network marketers to make money through MLM. Some products offered by the company includes,Meal replacement therapy,Red Yeast Coffee,Bubble C,spirulina among others. The company has offices in Douala and Yaounde. Tien group offers products in education,finance,biotechnology, health and others. The company had been in the market since 1997 and is found in more than 100 countries in the world. The Chinese company founded by Mr. Li Jinyuan equally has location in Cameroon precisely in Douala. The products available for MLM include beauty care and home care products. I read some few reviews on the facebook page of Tiens Cameroon . Here is one i selected for this post. The product offered by this company includes books,DVDs and training. That says it all about the company. The company is equally found in Cameroon , Douala. Training cash business is a Douala based MLM network. 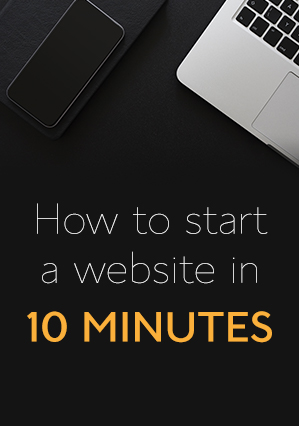 The company works in partnership with 1-9-90.com , a russian network marketing company. We have not been able to identify any product that this company has. If we find any we will update it. This is a US based company that offer health products and supplements. Some of the products includes, two minute miracle, anion pads, among others. The company has an office in Douala, precisely at Akwas nexttel building. AIM Global has been around for some time now in Cameroon with its members marketing health products and supplements. Amim global is a direct sales MLM company operating in many African countries , Cameroon inclusive. The Philippine based company has an office in Douala and Bamenda. 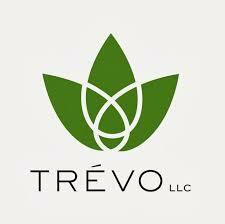 Trevor offers health product to it customers. With their MLM network being just a single line matrix, members can benefit from sales,matching bonus,charity bonuses,leadership bonuses among others. The major product of Trevor is ORAC which is said to have various nutritional and health benefits . 4corners is an MLM business found in the USA . The company offer financial freedom training books to it members. This means members can market financial freedom e-books once they sign up, in addition to their re feral bonus. 4 corners team Cameroon is one the most MLM whatsapp groups in Cameroon where 4 corner alliance members interact. The company is equally said to have an office in Douala, Cameroon. 4ever living products offers health products to it members. This permits members to equally gain from recruiting and sales at the same time. This company has offices in almost all regions of Cameroon with main office at Santa Babara Bonamossadi,Douala. Programs like Beonpush,Yeekong, Leocoins, JWCC,ASCOBETO and others are companies that are said to be operating in Cameroon. We have not done any verification for these companies. Let us know any network marketing program that you know in cameroon, if possible the location of the office. 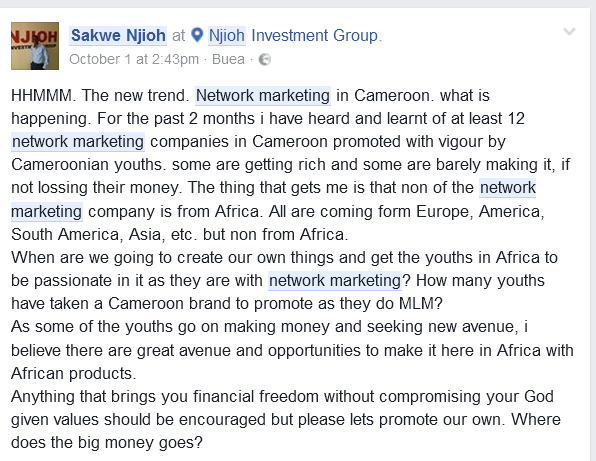 Permit me to share a screen shot of Mr Njioh's post about network marketing in Cameroon. Actually i updated this post thanks to this great Cameroonian. Let us promote Cameroon brands . we equally encourage Cameroon brands as well to engage in MLM because it motivates those promoting. But why are existing MLM networks in Cameroon not getting Popular? Which other MLM company do you know that is popular in Cameroon? Thats right. I have seen many Cameroonians doing Mazuma MLM.But the options to register seem difficult given the tech level of the average population and knowledge on online payments. Wow, this is interesting to learn and thank you for this top companies this helps me avoid scammers. All i want to know more how to do the process of signing up? Hi, select an MLM and inbox me so that i can help you with the sign up link. I dont sharre sign up links for MLM on my post. wow, great list. Is this all legit? I live in Orlando Florida and I am a mom. 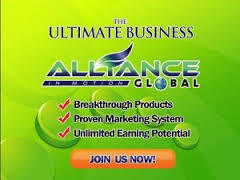 I am planning to do a business at home like joining an MLM networking. I found this source home business opportunities and this is great to know more essential information before joining such business. Thanks. I will like to know which one i s your choice. I got in contact with qnet which is a 2years old mlm ..is it legit ?? In my opinion it is not a recommended program t invest in. You can give it a try with $500 before puttting in some serious money. Hello Hussain, Please can you tell me more about DGsouk? what product do they offer? Thanks for your comment Prite. How can i be of help?